We know it's not really the choice of fancy houses that will make you want to own a home. It's the meaningful relationships you're bound to develop and cherish while living there. Hermoso Grande Floor Area: 150 sq.m. Hermoso Floor Area: 75 sq.m. Deluxe ceramic floor tiles for living, dining rooms, kitchen and bedrooms. Turriano Floor Area: 53 sq.m. Hidalgo Royale Floor Area: 41 sq.m. Sedeño Classique Floor Area: 44 sq.m. Palacios Grande Floor Area: 77 sq.m. Amorsolo Classique Floor Area: 65 sq.m. 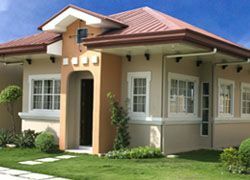 An additional P100.00/sqm for lots facing east. An additional P100.00/sqm for all corner lots. An additional P100.00/sqm for all made road lots. An additional P100.00/sqm for all lots beside & across parks & playgrounds. The 30% downpayment can be paid through Easy Equity Payment Plan. CEI reserves the right to correct typographical errors. For pictures and details of your choiced models and for other listings, contact the web host. VILA SOLANA - How many memories will you keep? Feel safe knowing you're acquiring your superbly located dream home for the best possible value for your money. Knowing that Villa Solana's sound experience ensures your new neighborhood has everything you'll need--water, drainage, telephone, cable TV, and Internet connection. As well as convenient access to schools, churches, hospitals, shopping malls, and the SRP Coastal Road. Please see pictures and house details. A. 10% Downpayment payable in 3 mos. (interest free) / 90% Balance payable in 36 mos. @ 16% interest p.a. B. 20% Downpayment payable in 4 mos. (interest free) / 80% Balance payable in 36 mos. @ 16% interest p.a. C. 30% Downpayment payable in 6 mos. (interest free) / 70% Balance payable in 36 mos. @ 16% interest p.a. 0 % of the equity must be paid within fifteen(15) days from reservation date. The balance of 70% of equity is subject to FEPS. The maximum period of FEPS is twelve (12) months at 12 % interest. • 10% of the equity must be paid within fifteen (15) days from reservation date. • Another 10% of the equity must be paid within forty-five (45) days from reservation. • Another 10% of the equity must be paid within seventy-five(75) days from the reservation date. • The balance of 70% of equity is subject to FEPS. • The maximum period of FEPS is twelve (12) months at 12% interest. FEPS interest is 12% straight per annum. In case of default, a 4% penalty per month on the amount due will be imposed. If buyer defaults on three (3) consecutive months, the Memorandum of Agreement (MOA) of the FEPS will be rescinded.